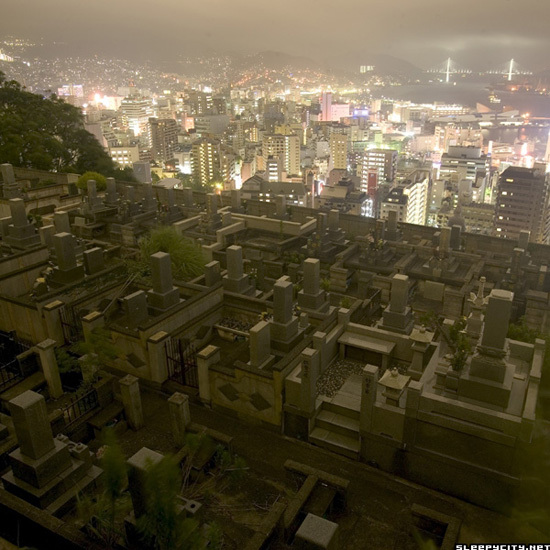 From Sleep City comes this photo of a hillside cemetery with a view of Nagasaki and its port, a cityscape within a cityscape, suggesting perhaps that it might not be such a bad idea to place cemeteries again in the center of town. That is, not simply inside the city limit, but rather build them right in the middle of downtown — in front of City Hall; on the 20th through the 35th floors of a skyscraper; converted from disused subway tunnels; next to Macy's. And with the right business model, it might even become a highly profitable venture, helping to turn a once blighted section of the city into a thriving urban scene. Convince celebrities and high society to be laid to rest inside, and it becomes a major tourist attraction. If, say, another Princess Di or a new River Phoenix dies unexpectedly and spectacularly inside and is then later buried there, then it could become the new Père-Lachaise. In other words, a cultural and community asset comparable to museums, theaters, schools and churches. But best of all, the throngs of daily commuters will get your daily dose of healthy philosophical musings on life, death and landscape architecture as they pass them by. Posting the Dead et al.